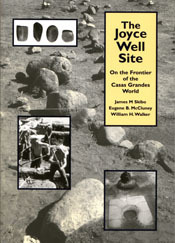 The Joyce Well site is in the remote boot heel of New Mexico, within the Gray Ranch, a huge spread whose owners continue to exercise careful control over its archaeological and natural resources. The site consists of a single-story pueblo of about 200 rooms that appears to have been associated with the Casas Grandes culture (Paquime) farther south in Chihuahua. Habitation peaked between AD 1200 and 1400. One of the questions researchers have sought to answer is the nature of the interaction between Paquime and sites such as Joyce Well. In 1963 Eugene McCluney excavated a portion of the pueblo and wrote a preliminary report. Since then, other researchers have conducted less ambitious projects there until Skibo and Walker excavated the ball court and conducted a large-scale investigation of the site and surrounding region in 1999 and 2000. This volume contains the 1963 report, plus all subsequent work. Analysis topics include plant remains, human skeletal material, ball courts and ritual performance, archaeomagnetic dating, and Animas Phase and Paquime comparisons. This publication makes the Joyce Well site accessible to all archaeologists for the first time.